Learn the Total Hip replacement: C stem AMT/Elite (Depuy) cemented hip (femur first) surgical technique with step by step instructions on OrthOracle. Our e-learning platform contains high resolution images and a certified CME of the Total Hip replacement: C stem AMT/Elite (Depuy) cemented hip (femur first) surgical procedure. 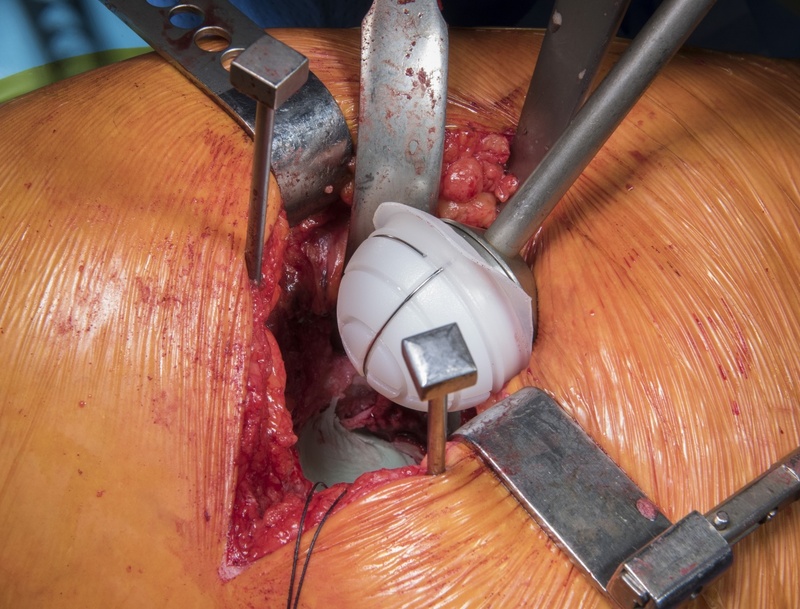 A cemented total hip replacement should be considered in the elderly population. It is forgiving to the ageing skeleton, there is a lower risk of fracture on both the acetabular and femoral bone when compared to uncemented designs. I favour the C-Stem AMT/Elite as it has a modular broaching system. This allows for intra-operative changes in neck size (high offset verses standard) without the need to change the broach. Furthermore, it allows the femur to be prepared first. I find that preparing the femur first speeds up the operation, by decreasing the number of steps required and allowing scrub staff to bring the required stem into the operating room when they go for the acetabular component. The Elite cup has excellent revision rates on the National Joint Registry of England, Wales and Northern Ireland 2017 at ten years in combination with both the Exeter (Stryker) and C-Stem AMT (Depuy) stems. I favour the C-stem AMT due to its modular neck options. A ceramic head is favoured as it has slightly lower revision rates compared to metal heads in this construct (NJR 2017) and where possible a 32mm head is favoured to reduce dislocation rates (a 43mm Elite cup requires a 28mm head).